With Halloween around the corner, now is a great time to prepare kids for trick-or-treating fun using pretend play to reinforce good manners, important safety tips, and proper Halloween etiquette. Here are some of our favorite ways for getting ready for Halloween with pretend play with lots of imaginative playtime fun thrown in! A BIG thank you to our friends at Melissa & Doug for sponsoring today’s creative play activity! Use this opportunity to show kids how to knock on the door, say “trick or treat” nicely, and reinforce the habit of making eye contact and saying “thank you”. 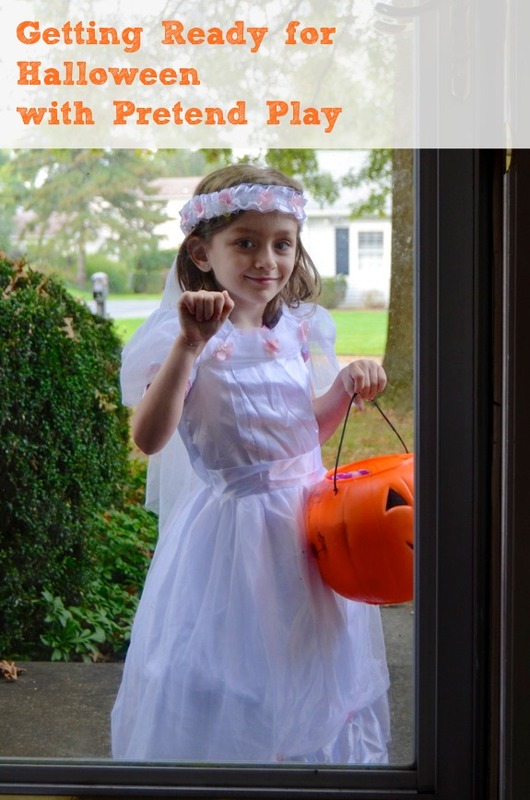 My daughter thought it was great fun to dress up, go outside, and knock on our door (or even better ring the doorbell) pretending it was Halloween! Give them play food/treats they would like, but also give them something you know they wouldn’t like and compare the differences in their reactions. When I pretend to be the little old lady who forgot it was Halloween and can only give out rotten lemons to trick or treaters, it’s an exaggerated example, but it’s also a good time to practice the art of saying “thank you” no matter the treat. Tip: Melissa & Doug have plenty of costumes (with props included) for Halloween or pretend play fun all year long! Get little ones in the habit of crossing the street with a trusted adult, and show them to look left, right, then left again before walking across. Our neighbors sometimes present the kids with entire bowls of candy for them to choose whichever one they would like. Teach them to choose whichever one is closest to them, and to not change their minds after the fact. My kids think it’s hysterical when I pretend to be the rudest trick or treater ever. (Banging loudly on the door, demanding treats, taking forever to choose the right candy, then changing my mind and complaining about it, etc…) After a bout of silliness, I then show them the proper way to trick or treat. This is a safe way for them to learn what proper trick or treating looks like. 1. If you are in a left-hand traffic country, make sure to look right, left, right! Thinking about trick or treating and practicing great ways to do it is such a great idea!